The 332nd Fighter Group is based out of Ramitelli Airfield in Italy. It is 1944, and the all-Black squadron of Tuskegee Airmen have been relegated to surveying runs and tasked with blowing up German trucks and trains. The brains in Washington do not believe them capable of taking on real missions, of having the skills to engage enemy fighters in real combat, a fact that drives aviators Joe ‘Lightening’ Little (David Oyelowo) and group leader Marty ‘Easy’ Julian (Nate Parker) crazy. But Captain A.J. Bullard (Terence Howard) refuses to allow his men to be belittled or undervalued. Through his unceasing efforts he’s gotten them their first major engagement lending air support to an important landing on a German-held beach. Major Emanuelle Stance (Cuba Gooding, Jr.) understands the importance of this mission, gets what will happen to his men if they fail. But Easy, Lightening and all the rest of the pilots aren’t about to take anything for granted, all of them intent on proving once and for all Black aviators are every bit as fit for combat as their White counterparts are. Good intentions only get you so far, and while producer George Lucas’ heart is in the right place that doesn’t make his WWII aerial extravaganza Red Tails any less of a disappointment. Not a failure, mind you, as there are moments too powerful and kinetically exciting for that to be so, but still unsatisfying nonetheless. The movie can’t help but pale when compared to the 1995 HBO flick The Tuskegee Airmen, no real surprise there as that effort is absolutely terrific even with its Cable television production values, but it also doesn’t hold up to pictures from the middle to late 1940’s its stylistically most reminiscent of. For all if its razzle and all of the expensive CGI dazzle, the feature is nothing more than an emotionally empty pictograph filled to the brim with melodramatic cliché. It’s John Ridley (Three Kings) and Aaron McGruder’s (Boondocks) script where the majority of the problems lie. Everything is far too familiar, far too simplistic. There aren’t any surprises, the dramatic intensity of the story diluted by the over-familiarity of the characters and the situations they end up encountering. Everyone is a WWII archetype, not a fully formed human being, and as such figuring out who lives and dies is way too easy. From the first few moments I knew what was going to happen to Easy and to Lightening, knew how their stories were going to turn out. Nothing unexpected ever happens, and the moment a character urges another to medically clear him or offers a beautiful Italian woman his hand in marriage it’s immediately clear what is going to happen next. It also doesn’t help that, while Parker and Oyelowo do their best, both actors are stranded playing characters so one-dimensional I’m not sure anyone could have brought them to life in a way that might have mattered. Their respective stories are so silly, so brazenly maudlin, they almost belittle the heroic characters they are supposed to be honoring. By breaking things down to such generalities Ridley and McGruder have eroded the story’s heart and damaged its soul, making the uplifting heroics of what these aviators accomplished ring irritatingly hollow. Howard and Gooding have a few nice moments, both basically doing their best Spencer Tracy and Cary Grant impersonations, and there are a couple of shocking moments of abject honesty that caught me a little off guard. The money Lucas spent on the production is also definitely up there on the screen everyone to see, and while the aerial battles are CGI-generated they’re still visually spectacular and it’s hard not to come away impressed by them. Director Anthony Hemingway is most known for handling crackerjack HBO productions like “The Wire” and “Tremé,” and he does manage to bring a stripped-down authenticity to some of the more intimate sequences. But the movie never manages to take flight and doesn’t achieve a kinetic velocity that could help make it a little more worthwhile. 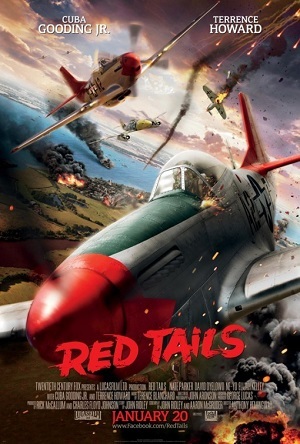 As a history lesson Red Tails simply doesn’t rise to the occasion, and while bits and pieces are adequate on the whole this is one flight into the wild blue yonder that never achieves liftoff.